As usual, late August’s warm weather was followed by delightful snow falls in early September. Looking around the surrounding hills with its sprinkling of powdery snow really does look like some giant has dusted the landscape with icing sugar. This weather for me is perfect, cold, that bone chilling, bracing cold that I love but with more daylight hours to give you a chance to get out amongst it in the sunshine. In the vegetable garden, there’s not too much happening. Beds are covered with mulch and resting up until the late spring plantings of tomatoes, zucchini and pumpkin. The green house is where the action is for now, home to trays of little seedlings, growing happily in the longer daylight hours. I just have to remember to water the fragile little wisps. Early spring is known as the hungry gap. Winter crops are all but finished and it’s too early for spring or summer vegetables. In our garden, there is as ever, that stalwart rhubarb to keep us happy and we have been enjoying rhubarb cakes and crumbles. 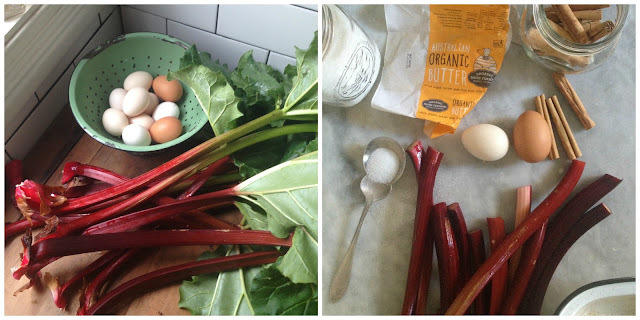 Add to this the frenzied egg laying of our hens and you have the makings of that classic partnership; rhubarb and custard. Thankfully, in the wild there is a lot to eat for the knowledgeable forager. The nettle patches are lush and green with new spring growth if you know where to find them. And I was lucky enough that a friend shared where to find some wild garlic. 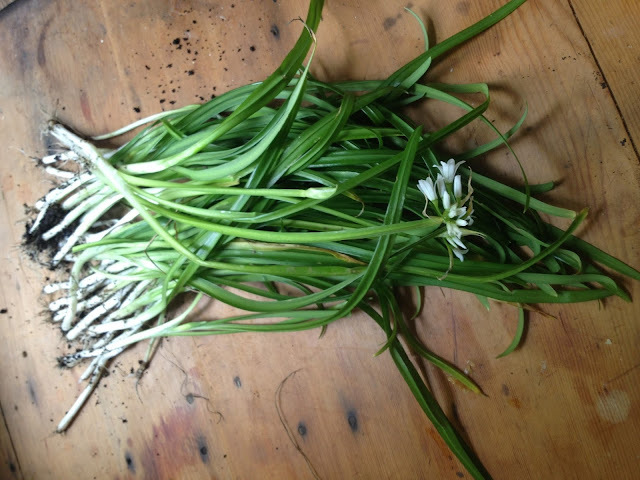 Our wild garlic is a different type to the wild garlic known as ramsons you read about in the northern hemisphere. The wild garlic I picked along the river bank has a narrower leaf shape, but that lovely gentle garlic aroma leaves you in no doubt to what you are picking. Sunny cold days, a warm fire and good things to eat. I’m feeling that spring cleaning urge to rearrange the furniture, have a huge declutter and give the windows a wash to let that bright spring sunshine in. Although I might leave the panes with Spoons muddy paw prints splattered on the glass. First I’ll put the kettle on the wood stove for one more cup of tea. Winter is lingering here in Perth which is strange but nice. Despite all the rain & grey skies today we got into a bit of Spring cleaning - Tim done the windows THANK GOD! because I hate that bloody job ! I am SO JEALOUS that Tim washed your windows! Leo used to be fanatical about washing widows but he hasn't done it for years since we moved down here. It's not a pleasant task with all our French windows but it's so good when you've finished. 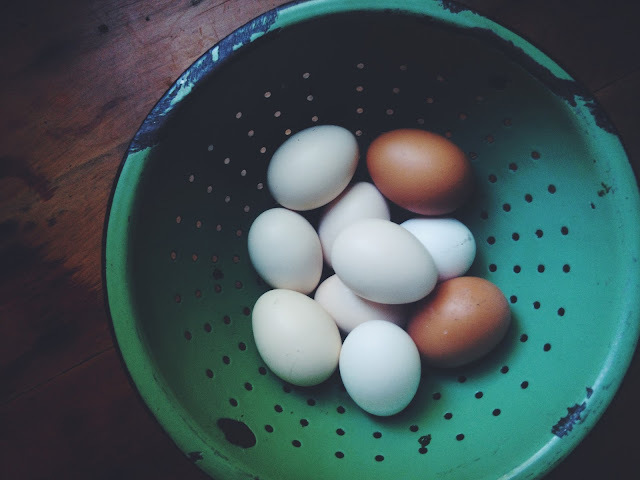 You'll get your hens one day...but I wish I could send you my excess eggs in the meantime! The rhubarb here is a staple too. It's had 4 moves over the last couple of years and it hasn't seemed to have minded at all. It's such a hardy plant rhubarb, that's amazing you've moved it four times! I love shopping for fresh produce at the first week of spring! I used to frequent our local farmer's market before I got too busy managing a Chinese Restaurant in Capalaba area. You inspired me to check out the market this weekend! thank you so much for your kind words Rebecca! I feel very lucky to live here! Your post saved dinner for me last night Michelle. Finding us out of garlic as I was chopping up the silverbeet I realised I could dash outside and pull up a handful of wild garlic instead. I have been trying to get rid of this invasive weed (I always called it onion grass and never thought of eating it) but I am thinking about it differently now!